You can book cheap Emirates flights today on StudentUniverse; we’ve teamed up with the award-winning airline to bring you some seriously impressive fares. Once you have confirmed your status as a student or youth traveller, you gain access to our exclusive student and youth discounts. This means you can save big compared to normal prices! Alternatively, if you have an Emirates promo code, that can save you money on Emirates flights, too. Emirates is one of the world’s best airlines, so there couldn’t be a better way to begin or end your trip: you’re always sure to have a great flight. It was even named the best airline for students in 2015 (admittedly by us, but we know what we’re talking about) for specialising in understanding the unique trends of student travel. Whatever your reason for taking a trip, be it for study, work abroad placements or simply to just have an amazing holiday, an Emirates student ticket will guarantee you get there in style. 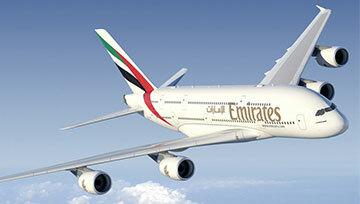 Emirates flies to a huge amount of destinations. Over 140 cities on six continents are served around the world, from London to Cape Town to Delhi to Bangkok to Auckland to Sydney to Phuket. From the UK alone there are 16 daily departures to Dubai, where the airline is based, from airports including London Heathrow, Manchester, Glasgow, Edinburgh and Belfast. Emirates fly to practically every major city in the world, so wherever you want to go, Emirates can get you there – or at least close!. 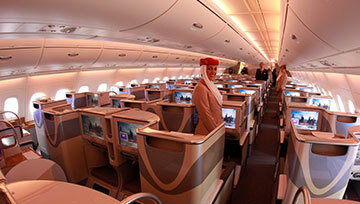 Don’t be put off by the word ‘economy’ – you’ll feel like a superstar flying with Emirates, whatever your class of seat. With cabins expertly designed to maximise space and comfort, special lighting which minimises the chance of jetlag, and a fantastic choice of meals, it’s hard to imagine a more relaxing travelling experience. Add to that the best online entertainment system of any airline in the world, and you might just not want to get off. Oh, there are also unlimited beverages, including alcoholic ones. Winner. Finding an Emirates flight deal is easy with StudentUniverse if you are a student or aged 18-26: if there’s a deal to be had, we’ll ensure you get it! You could end up saving loads of money if you book with us, so be sure to use the flight search box above to find your dream ticket.